Born into a wealthy Melbourne family, Australia’s James boys never resorted to crime like outlaw Jessie James, though in 1896 they decided to try their luck in the wild west – driven as much by wanderlust as their lust for gold. After 12 months of bad luck or boredom in the harsh West Australian outback, they decided to return home – by pushbike. That the journey across the Nullarbor had never before been attempted without camels was immaterial; and their preparations consisted of no more than carrying a puncture repair kit, a billy with the makings for a cuppa, a spare pair of undies and, possibly anticipating some walking, two pairs of socks. Forty-seven days and 4093km after leaving Mount Magnet, Bert and Fred rode into Geelong to be met by brothers Jack and Ed to enjoy “much talk and some wine”. Dunlop publicist Harry James (no relation) was soon on their case promoting the fact that, while Fred was on a White cycle and Bert had ridden an Electra, both treadlies were shod with Dunlops and had managed the journey without a single puncture – “that distressing and language-provoking mishap, which so often arouses the ire of the pedaller”. Having survived the hardship of pedalling across the loneliest and most inhospitable stretch of terrain in the country, Bert and Fred were off to the Boer War, which turned out to be Bert’s first full-time job. Both lads survived. And, on returning to the family home in St Kilda, discovered a world being transformed by motor vehicles. 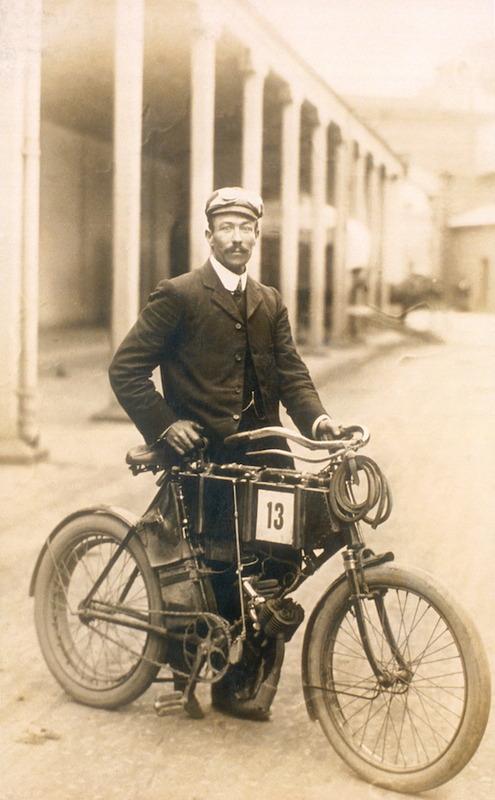 When Dunlop announced the 1905 Reliability Trial would finish in their home town of Melbourne, with all Victorian competitors and their machines being shipped north to Sydney for the start, Bert was first among the 15 motorcyclists to take up the challenge. To the winner would go the Buchanan Cup, which became known as the Dunlop Cup. 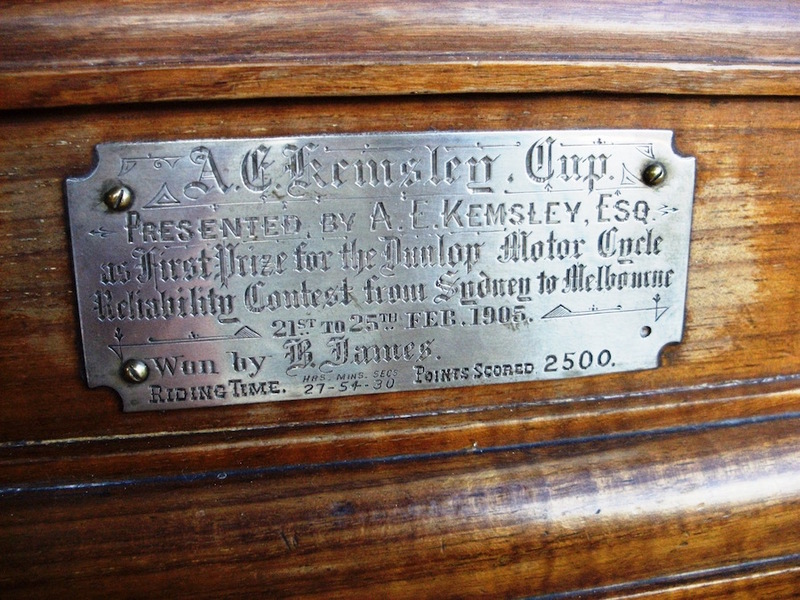 Less well publicised was that Mr A. E. Kemsley, a wealthy Sydney motorcycle importer, offered a magnificent cup to the winner of “any motorcyclists rash enough to attempt the journey on their motorised bone shakers”. It is fascinating to note that James, 32, and Gard, 21, were half-brothers. Like most of the motorcycles, Bert’s Minerva was little more than a heavy-framed pushbike powered by a very small motor. It was the least expensive and least powerful motorcycle in the event, but also one of the lightest – which was a great advantage when crossing the many creeks and muddy gullies along the route. There is some conjecture that Bert built the motor as the initials B.J. were prominent on the engine casting. More likely that Bert had his initials engraved on what was a Belgian-built 232cc two-stroke of 1¾hp. Less has been reported about the second Dunlop Reliability Trial in 1905, which started in and returned to Melbourne. Improbable as it may seem, it was Freddie James, Bert’s 35-year-old brother and transcontinental companion, who was declared the winner. Who could have scripted that?